An ABAP Consultant works with the functional team to understand the functional design needs, prepares technical specifications, modifies and projects before coding suitable solutions. 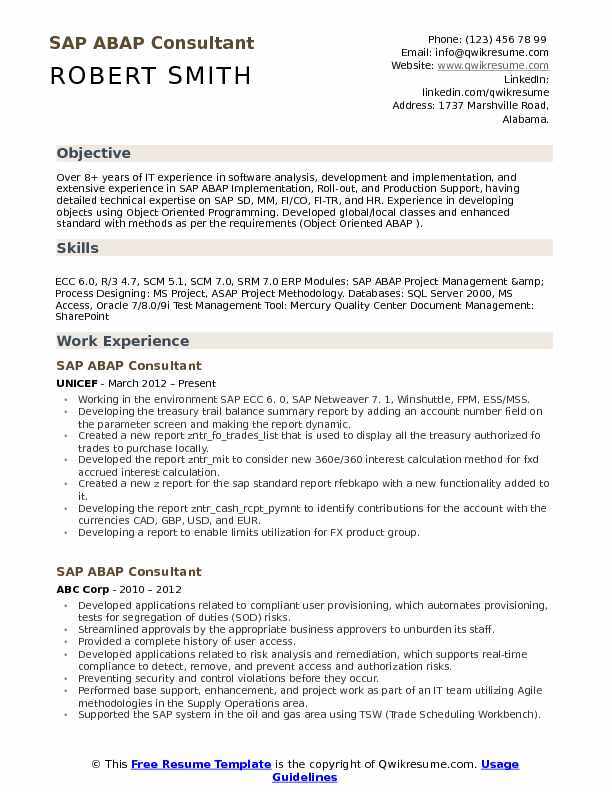 The common responsibilities demonstrated on the ABAP Consultant Resume are developing detailed plans for completion of system testing and transforming business function needs into technical programs specs, testing and debugging programs, developing, coding and executing unit tests, performing performance tuning, engage other members in designing and deployment of effective solutions, and ensuring integration system like monitoring technical architecture to meet all SLA’s. 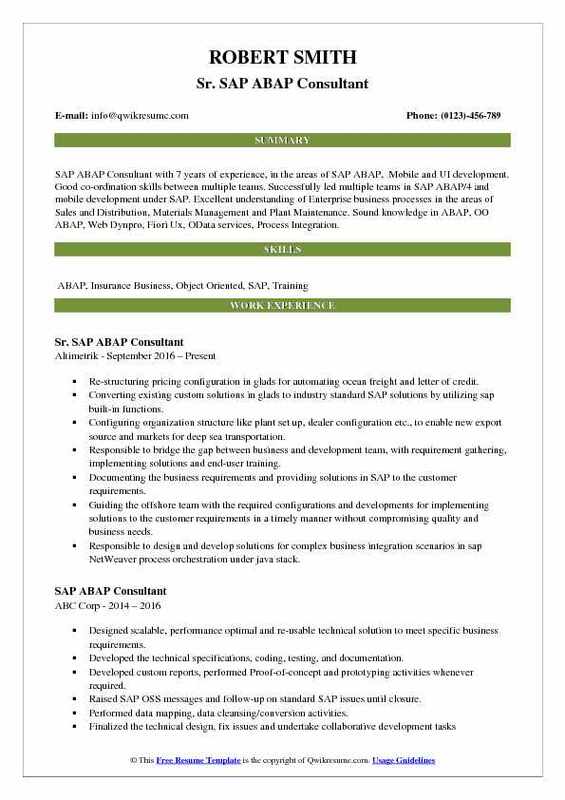 To become a successful ABAP consultant a candidate must possess significant SAP Systems and architecture knowledge, ABAP programming tools, exposure to HANA and have a thorough knowledge of .net, Java, C++, and C. A University Degree in Computer Science, IT coupled with SAP certification is regarded as the best ABAP consultant resume by hiring employers. 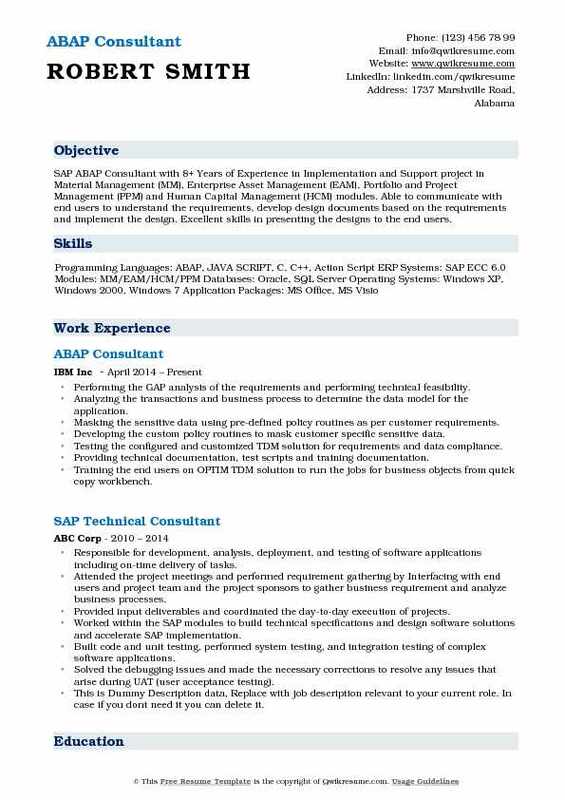 Summary : Over 8+ years of IT experience in software analysis, development and implementation, and extensive experience in SAP ABAP Implementation, Roll-out, and Production Support, having detailed technical expertise on SAP SD, MM, FI/CO, FI-TR, and HR. Experience in developing objects using Object Oriented Programming. Developed global/local classes and enhanced standard with methods as per the requirements (Object Oriented ABAP ). Working in the environment: SAP ECC 6. 0, SAP Netweaver 7. 1, Winshuttle, FPM, ESS/MSS. Developing the treasury trail balance summary report by adding an account number field on the parameter screen and making the report dynamic. Created a new report zntr_fo_trades_list that is used to display all the treasury authorized fo trades to purchase locally. Developed the report zntr_mit to consider new 360e/360 interest calculation method for fxd accrued interest calculation. Created a new z report for the sap standard report rfebkapo with a new functionality added to it. Developing the report zntr_cash_rcpt_pymnt to identify contributions for the account with the currencies CAD, GBP, USD, and EUR. Developing a report to enable limits utilization for FX product group. Working on spot purchases and sales report to resolve an issue with 1:1000 translation ratio. Developing a report to turn on transaction fte_bsm for monitoring bank statements. Adding functionality to the treasury daily diary to add fixed income securities interest. Working on the treasury trail balance and summary reports to identify the new emerging market product types on GLS that are segregated by product types. Skills : Tables, Structures, Data Elements & Domains, Classical, Interactive, ALV Reports, BDC Input Session, Call Transaction, Direct Transfer & LSMW, RFC, BAPI, ALE, IDOC, EDI, WORKFLOW, Screen Painter And Dialog Programming, Sap Scripts, Smart Forms And Adobe Forms. Developing a report in ALV titled view sales orders. The objective of this report is to search the application database for open sales orders. The inputs are sales organization, sold to party, material no, customer purchase order no, and sales order creation date. Developing ALV reports with web Dynpro and developed web Dynpro applications with view, windows and configured outbound, inbound plugs and bind them with navigation links. Customizing and modifying IDoc for the PO acknowledgment using ALE and EDI techniques. Using master_IDoc_distribute, to create the IDocs. Designing, developing, testing and implementing the workflow for vendor master creation. Working on data transfer using BAPI method in LSMW tool to upload data from legacy system to SAP system for the material master. Developing an LSMW, which is used for uploading customer master data to migrate customer master data from legacy system to SAP r/3 database. Written BDC programs to update and change vendor master data by session method for transactions xk01 and xk02. Updating sales order, purchase order and delivery linked to both sales order and stock transfer order using BAPIs. 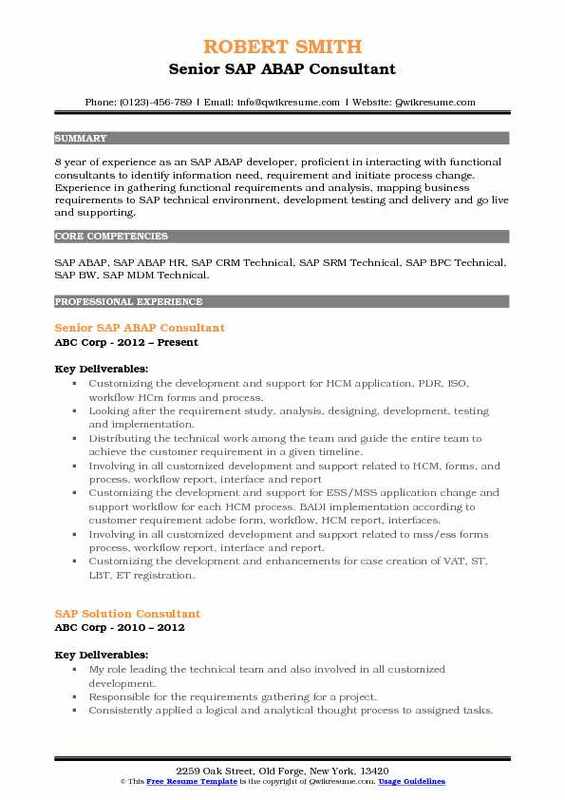 Headline : SAP ABAP Consultant with 7 years of experience, in the areas of SAP ABAP, Mobile and UI development. Good co-ordination skills between multiple teams. 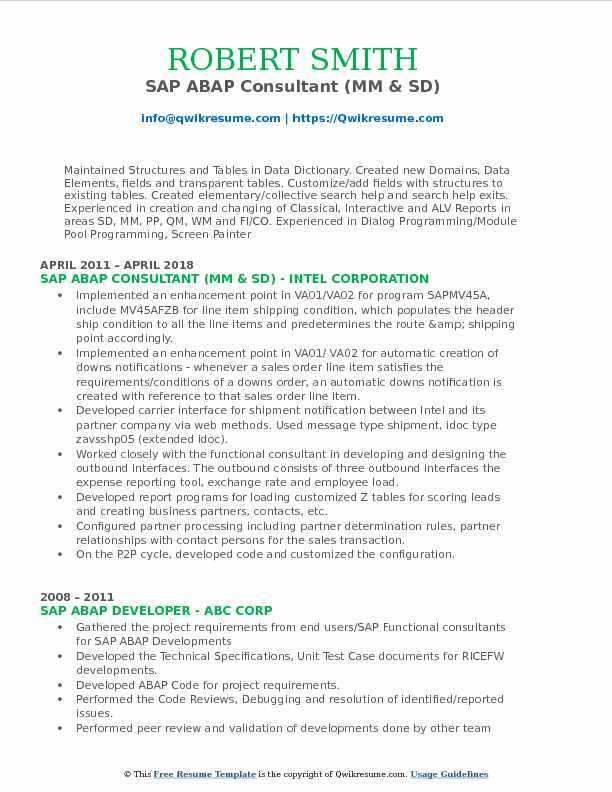 Successfully led multiple teams in SAP ABAP/4 and mobile development under SAP. Excellent understanding of Enterprise business processes in the areas of Sales and Distribution, Materials Management and Plant Maintenance. Sound knowledge in ABAP, OO ABAP, Web Dynpro, Fiori Ux, OData services, Process Integration. Re-structuring pricing configuration in glads for automating ocean freight and letter of credit. Converting existing custom solutions in glads to industry standard SAP solutions by utilizing sap built-in functions. Configuring organization structure like plant set up, dealer configuration etc., to enable new export source and markets for deep sea transportation. Responsible to bridge the gap between business and development team, with requirement gathering, implementing solutions and end-user training. Documenting the business requirements and providing solutions in SAP to the customer requirements. Guiding the offshore team with the required configurations and developments for implementing solutions to the customer requirements in a timely manner without compromising quality and business needs. Responsible to design and develop solutions for complex business integration scenarios in sap NetWeaver process orchestration under java stack. Supporting the critical web services design and deployment in glads and to guide offshore team for timely delivery of the interfaces as per the business needs. Web service interfaces enable communication between glads, ocean carriers and port processors (modification centers). 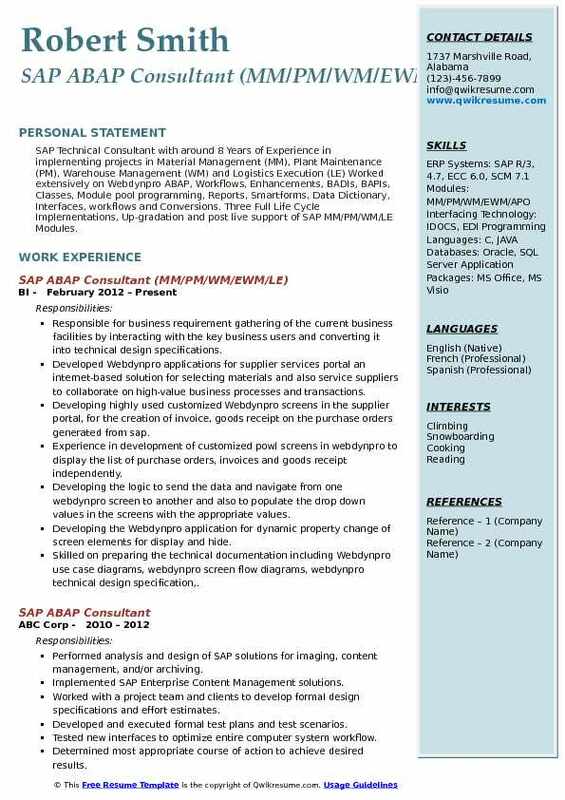 Headline : SAP ABAP Consultant with 4 years of experience is seeking to achieve growth for the organization by optimizing SAP with help of my strong SAP ABAP skills, Client Relationship Management skills, the experience of various ABAP techniques and ability to work in every environment. Acting as the SAP side techno-functional analyst and analyzed the business requirements. Creating technical design documents for in scope real-time and batch interfaces. Providing resolution to high and critical business incidents real time. Checking for issues for multiple modules like SD (sales and distribution), MM (materials management), FICO (finance and controlling), PP (production planning), GTS (global trade systems). Enhancing the cubiscan interface by adding multiple features for the material master update for peak values. Got various appreciations for this complex issue resolution. Correcting and enhancing the DMM (dynamic machine management) interface to send production order (collective as well as normal orders) data from SAP to DMM. Creating the copy of standard vendor consignment program MRKO and added various additional functionalities to it. Fixed a big issue of ESHM module job which earlier running for 7 hours was reduced to 38 mins. Summary : SAP Technical Consultant with around 8 Years of Experience in implementing projects in Material Management (MM), Plant Maintenance (PM), Warehouse Management (WM) and Logistics Execution (LE) Worked extensively on Webdynpro ABAP, Workflows, Enhancements, BADIs, BAPIs, Classes, Module pool programming, Reports, Smartforms, Data Dictionary, Interfaces, workflows and Conversions. Three Full Life Cycle Implementations, Up-gradation and post live support of SAP MM/PM/WM/LE Modules. Responsible for business requirement gathering of the current business facilities by interacting with the key business users and converting it into technical design specifications. Developed Webdynpro applications for supplier services portal an internet-based solution for selecting materials and also service suppliers to collaborate on high-value business processes and transactions. Developing highly used customized Webdynpro screens in the supplier portal, for the creation of invoice, goods receipt on the purchase orders generated from sap. Experience in development of customized powl screens in webdynpro to display the list of purchase orders, invoices and goods receipt independently. Developing the logic to send the data and navigate from one webdynpro screen to another and also to populate the drop down values in the screens with the appropriate values. Developing the Webdynpro application for dynamic property change of screen elements for display and hide. Skilled on preparing the technical documentation including Webdynpro use case diagrams, webdynpro screen flow diagrams, webdynpro technical design specification,. Designing and development of ricefw objects, formulating unit test plans for ricefw objects and deployment of solutions. Used BAPI function call, BAPI_salesorder_createfromdata for creating sales order in sap system from the external system. Worked with BAPI_po_getdetail to get the details of delivered quantity of each items in the po and also worked with bapi_po_change to change the po. 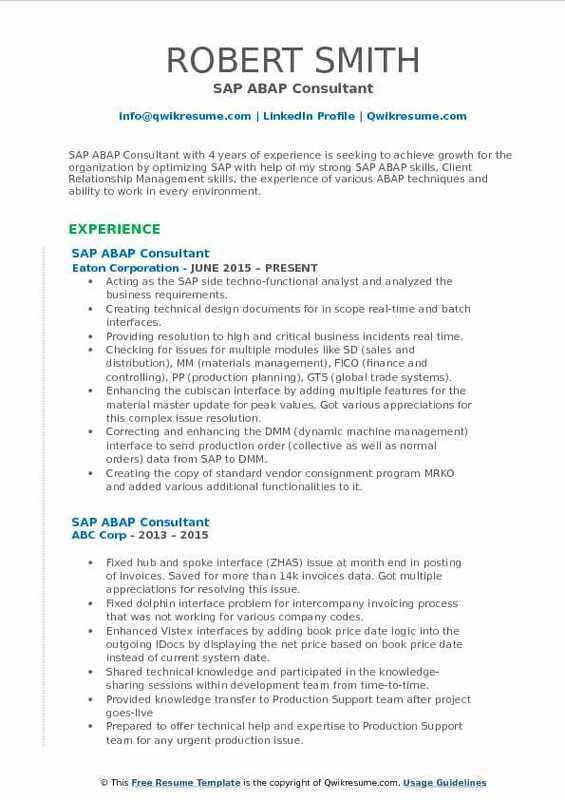 Summary : SAP ABAP Consultant with 8+ Years of Experience in Implementation and Support project in Material Management (MM), Enterprise Asset Management (EAM), Portfolio and Project Management (PPM) and Human Capital Management (HCM) modules. Able to communicate with end users to understand the requirements, develop design documents based on the requirements and implement the design. Excellent skills in presenting the designs to the end users. Performing the GAP analysis of the requirements and performing technical feasibility. Analyzing the transactions and business process to determine the data model for the application. Masking the sensitive data using pre-defined policy routines as per customer requirements. Developing the custom policy routines to mask customer specific sensitive data. Testing the configured and customized TDM solution for requirements and data compliance. Providing technical documentation, test scripts and training documentation. Training the end users on OPTIM TDM solution to run the jobs for business objects from quick copy workbench. Gathering the requirements for the HR Payroll and Master Data (infotypes) templates development for OPTIM TDM SAP. Identifying the clusters for the HR Payroll and tables for HR infotypes to retrieve the data and update in the target system. Developing the outbound interface to retrieve data using ldb or BAPI or direct table fetch using ABAP. Implemented an enhancement point in VA01/VA02 for program: SAPMV45A, include MV45AFZB for line item shipping condition, which populates the header ship condition to all the line items and predetermines the route & shipping point accordingly. Implemented an enhancement point in VA01/ VA02 for automatic creation of downs notifications - whenever a sales order line item satisfies the requirements/conditions of a downs order, an automatic downs notification is created with reference to that sales order line item. Developed carrier interface for shipment notification between Intel and its partner company via web methods. Used message type: shipment, idoc type: zavsshp05 (extended idoc). Worked closely with the functional consultant in developing and designing the outbound interfaces. The outbound consists of three outbound interfaces the expense reporting tool, exchange rate and employee load. Developed report programs for loading customized Z tables for scoring leads and creating business partners, contacts, etc. Configured partner processing including partner determination rules, partner relationships with contact persons for the sales transaction. On the P2P cycle, developed code and customized the configuration. Configured and extended the material master Idoc MATMAS03 and customer master Idoc DEBMAS03 for transferring material and customer information from SAP to Biztalk. Setup delvry05 idoc for receiving the shipping notification and creating an inbound delivery in sap. Developed an enhancement program to send desadv05 idoc after the goods receipt issue for the purchase order. 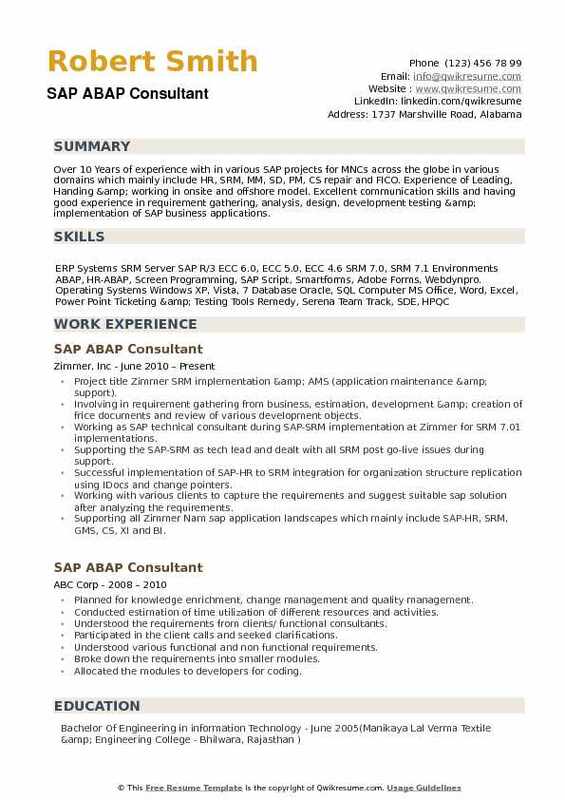 Summary : 8 year of experience as an SAP ABAP developer, proficient in interacting with functional consultants to identify information need, requirement and initiate process change. Experience in gathering functional requirements and analysis, mapping business requirements to SAP technical environment, development testing and delivery and go live and supporting. Skills : SAP ABAP, SAP ABAP HR, SAP CRM Technical, SAP SRM Technical, SAP BPC Technical, SAP BW, SAP MDM Technical. Customizing the development and support for HCM application, PDR, ISO, workflow HCm forms and process. Looking after the requirement study, analysis, designing, development, testing and implementation. Distributing the technical work among the team and guide the entire team to achieve the customer requirement in a given timeline. Customizing the development and support for ESS/MSS application change and support workflow for each HCM process. BADI implementation according to customer requirement adobe form, workflow, HCM report, interfaces. Involving in all customized development and support related to mss/ess forms process, workflow report, interface and report. Customizing the development and enhancements for case creation of VAT, ST, LBT, ET registration. Designing and configuring workflow for each registration process. BADI implementation according to customer requirement. Customizing the development to capture data for dispute case creation. BADI implementation pre fill data for dispute case creation (fbl5n). Leading technical team and also involved in all customized development. 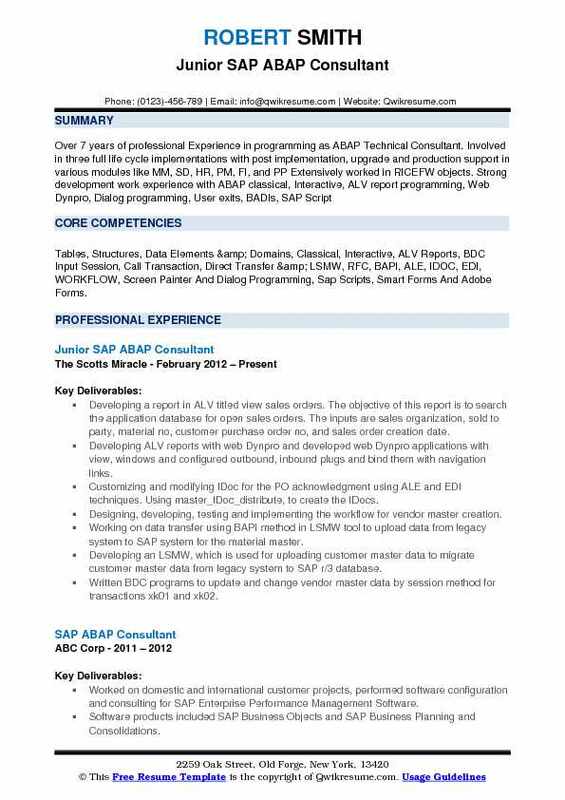 Summary : Around 7+ years of experience as SAP ABAP Technical Consultant with good knowledge of R/3, ECC system environments and ABAP/4 programming techniques, along with extensive working experience in PI/XI, Webdynpro, Workflow and EDI technologies. 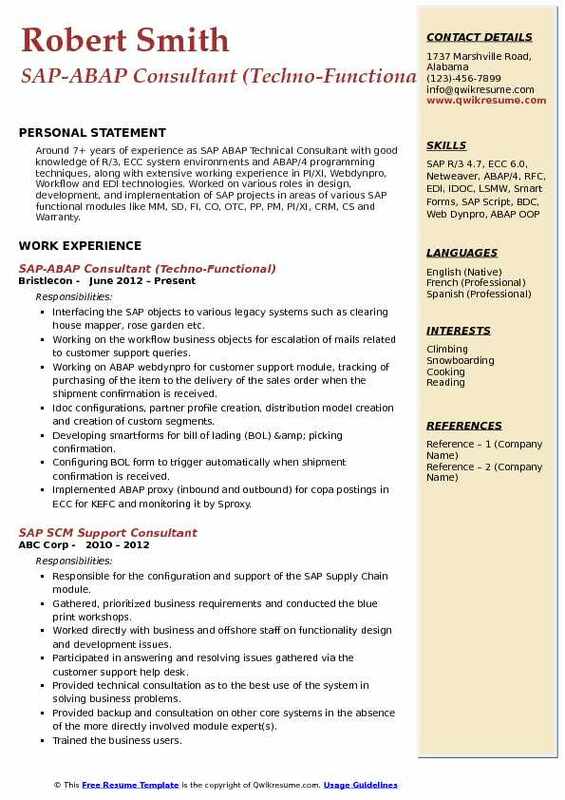 Worked on various roles in design, development, and implementation of SAP projects in areas of various SAP functional modules like MM, SD, FI, CO, OTC, PP, PM, PI/XI, CRM, CS and Warranty. Interfacing the SAP objects to various legacy systems such as clearing house mapper, rose garden etc. Working on the workflow business objects for escalation of mails related to customer support queries. Working on ABAP webdynpro for customer support module, tracking of purchasing of the item to the delivery of the sales order when the shipment confirmation is received. Idoc configurations, partner profile creation, distribution model creation and creation of custom segments. Developing smartforms for bill of lading (BOL) & picking confirmation. Configuring BOL form to trigger automatically when shipment confirmation is received. Implemented ABAP proxy (inbound and outbound) for copa postings in ECC for KEFC and monitoring it by Sproxy. Implemented MDM system for passing data of customer master and material master data using ALE/IDoc. BTE is used for standard tcode: FK01/FK02/FK03, for passing vendor master data to MDM. Implemented BTE: 2441 for IDoc type paytext for updating vendor address details during cheque generation from tcode F110. Implementing the standard FI-postings using inbound Idoc with message types: Cremas, Debmas and Matmas for acc_document IDoc for AR, AP and GL. Summary : Over 10 Years of experience with in various SAP projects for MNCs across the globe in various domains which mainly include HR, SRM, MM, SD, PM, CS repair and FICO. Experience of Leading, Handing & working in onsite and offshore model. Excellent communication skills and having good experience in requirement gathering, analysis, design, development testing & implementation of SAP business applications. Project title Zimmer SRM implementation & AMS (application maintenance & support). Involving in requirement gathering from business, estimation, development & creation of frice documents and review of various development objects. Working as SAP technical consultant during SAP-SRM implementation at Zimmer for SRM 7.01 implementations. Supporting the SAP-SRM as tech lead and dealt with all SRM post go-live issues during support. Successful implementation of SAP-HR to SRM integration for organization structure replication using IDocs and change pointers. Working with various clients to capture the requirements and suggest suitable sap solution after analyzing the requirements. Supporting all Zimmer Nam sap application landscapes which mainly include SAP-HR, SRM, GMS, CS, XI and BI. Handling a team of 4 persons at offshore (India) and make sure they are utilized effectively. Creation & modification of bonus /merit/lti statements using smart forms and translating them into various languages. Managing the ESS/MSS portal which includes linking the SAP forms with ESS/MSS links which are driven by country and role of a person. Creating the RFC and connect them with ESS/MSS portal link which will be used to call various forms or tabular data for various matrices.